For a nonprofit, transparency is critical for trust, support, loyalty, and long-term sustainability. This means financial accountability, openness about mission and planes, and a holistic view of the organization. Transparency also means that a donor’s rights are clearly informed. An organization’s internal work is directly related to the support it externally receives; therefore, nonprofits should give priority to this crucial segment of information to communicate with prospective and existing donors and supporters. Fundraising will be truthful and accurately described. Donations will be spent in accordance with the donor’s intent. Donors will receive prompt, forthright answers to questions. Donors have the right to be informed of the organization’s mission and purpose. Fundraising will respect the dignity and privacy of those who benefit from the organization’s activities. Donors will receive appropriate acknowledgment and recognition for their gift. The organization will respect the donor’s requests to remain anonymous. Upon request, donors are entitled to promptly receive the organization’s most recent stewardship report and proof of 501 (c) 3 tax-exempt status. Donors will have the opportunity to have their names deleted from mailing and fundraising solicitations. Their opt out request will be honored promptly. The organization will respect donors’ privacy by not sharing, selling, or renting names and personal information. Donors can expect that all relationships with individuals representing the organization will be professional in nature and that they will be treated with respect, compassion and dignity. Informing the donor that their information is confidential, and that your organization does not sell to or share donor information with anyone, including partners and affiliates. Informing the donor that your organization uses the information to accept and process gifts, and providing the donor with the option to receive updates such as mailings and newsletters. Informing the donor of the type of information that is gathered: name, address, credit card or payment method information, to properly process gift transactions, and that it is protected through a trusted solution for online security. Informing donors of their rights ensures them that their monetary gifts are utilized with respect and gratitude. This also empowers donors in feeling that their giving is in their control, and provides them with autonomy regarding the personal information they may share. Philanthropy merits loyalty and dedication, and this is where non-profits are to uphold their end by honoring donor’s rights with integrity and compassion. Strategic planning is fundamentally about making choices. While that sounds easy, it is often challenging to do. Planning committees or executive teams must identify and agree upon what their organization will do as well as what it will not do. In a world of limited resources (e.g., money, staff, time) organizations can’t afford to try and be all things to all people. This is particularly true in the nonprofit sector where resources are always tight and donors are, and should be, vigilant about how their money is used. The first step in developing a strategic plan is setting the organization’s goals. Goals are statements about what the organization is trying to achieve. The more specific you can be the better. For example, one local organization had a goal “to help people fight poverty”. It did a great job of fundraising and allocated over $1 million every year to local charities serving the poor. The grant committee found so many organizations needing help that they donated to over ninety-five each year across the spectrum of education, food services, shelters, addiction programs, and more. There was such a need, that they were giving a small amount of money to almost every charity that applied. They didn’t have specific goals in place to evaluate A) which types of charities they should be funding and B) what impact they were looking to achieve. After conducting a strategic planning process, they honed their goal to “reducing poverty by finding and funding programs that seek lasting change”. This more specific goal enabled the committee to develop more actionable objectives. The committee then put numerical targets on each area to track progress year over year. The organization was making real strategic choices about what it would do and what it wouldn’t do. These objectives also helped focus their discussions with major donors, grant-seeking agencies and new volunteers. As a result, donors better understood where their money was going. Grant-seeking agencies didn’t waste their time applying if they didn’t fit into these three areas. Volunteers could target a key area and track their impact each year. The second major step in strategic planning is to define your target audiences and specify what you want them to do. Again, this requires an organization to make choices. Does the all-boys school in town target every boy between the ages of 4 and 18? Does the Episcopalian Church target all Christians in the area? Does the Breast Cancer Center target all women? Seeing as all Christians don’t act the same and neither do all boys or all women, this would be difficult. The church wanted more families but didn’t invest against the needs of that audience. Hence, those families joined churches that spent resources on Sunday School, Youth Group Programs and Family Mission Projects. Next, you need to be very clear about what you want them to do (desired behavior). Do you want them to volunteer? Donate? Spread the word? Educate? Finally, you need to determine whether “who they are” matches with “what you want them to do”? For example, a diabetes organization’s target audience was kids who have Type 1 diabetes. And, the organization wanted these kids to help spread awareness about how difficult it is to live with diabetes. By doing so, the organization believed more people would donate to find a cure. Sounds easy, however, this assumes that kids with Type 1 diabetes want to talk about it and want to draw more attention to it. The diabetes organization needs to understand what they believe, how they behave and what motivates them. Step 3: How Are You Going to Engage, Convince, and Excite Your Targets? Now that you have identified target audiences and their desired behavior, you’re ready to make choices about how to reach them. Which channels will you use? What messages will you deliver through each channel? Will that reach them and activate them? Again, start with their behavior. If you are targeting an older demographic then investing in a strong social media presence may not be the best use of resources. You’ll want to find out where they spend their time, where they get information and news and who they trust. Once you’ve completed Steps 1-3, you will need to map resources against the plan. For example, if part of your plan is to target major donors, then you’ll want to invest in having someone on the team who qualifies as a Major Gifts Officer. They will know what processes to build, how to cultivate relationships and how to build a communication strategy. Alternatively, if your plan is to target young professionals through a major social media campaign, then actively surround yourself with people who deeply understand different social media outlets, how they are used and what types of programs are most effective. Most of us in the nonprofit space are extremely passionate about what we do and what we want to accomplish. This can be a huge asset. Many organizations in the for-profit space wish their employees could be as passionate about the goods, services or ideas they create as those in the nonprofit sector. Passion can also be a liability when it overshadows pragmatic decision-making. The most successful nonprofits have found the right balance between passion and business rigor. As such, it’s very important to review your strategic plan with several people who A) have expertise you don’t have and B) don’t have a vested interest in your success. While humbling, this effort will make you and your plan more successful. It will force you to think about things you may have missed or address inconsistencies you are too close to see. Ultimately, nonprofits are stewards of other people’s money in an attempt to accomplish a goal or provide a good or service. A well thought-out strategic plan will ensure this is accomplished as effectively as possible. Over the years, the term “strategic planning” has become so commonly used (and misused) that it has practically lost its meaning. 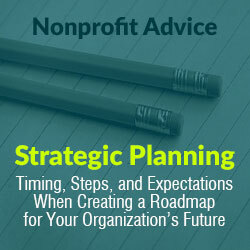 Strategic planning—creating a roadmap for an organization’s future—is a critical process. It’s important to determine if and when it’s the right time to start the process; what the key components, steps, and benefits are to creating a successful plan; and who should be involved in the process. As is true in many things, proper timing is essential to the strategic planning process. While it can be tempting to want to conduct strategic planning when a crisis hits, this is the worst time to consider it. It does not make sense to plan an organization’s future through the lens of a crisis when its immediate future is in question. It is best to conduct crisis planning (ideally before a crisis hits) and consider the longer term future when your organization is back in steady waters. 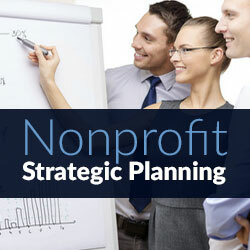 Going through the strategic planning process to fulfill a grant requirement can also be problematic. Not only can it bring into question the integrity of the process, but it is also not mission-based, which is a fundamental component of successful strategic planning. Strategic planning has two main purposes: to determine what an organization intends to accomplish in the future and to figure out how to get there. This process is best undertaken when an organization is stable and has the time, resources, data, and stakeholder buy-in to fully complete the process. In addition, it is essential that the leadership intends to follow through on the recommendations. There is no sense in creating a plan that will never be properly implemented. So, how long does it take to create a strategic plan, and how long a time period should it cover? The size and complexity of an organization are significant factors in determining the amount of time it takes to create a strategic plan, but in general, you should be prepared to spend several months creating a framework. If you take significantly longer than that, the plan can lose relevance, momentum, and stakeholder interest. Given the amount of time they take to create and implement, most strategic plans cover a time period of 3 years—long enough to allow time for the plan to be enacted and show results, but not so long that the data and goals should change. Day-long and weekend retreats dedicated to strategic planning have become popular for many organizations, but ideally, the process should be spread over several months, so that true perspective and adequate time can be given to data collection and mapping out the future of your organization. Who Should Take Part in the Process? Exclusivity is critical to effective strategic planning. Gathering input exclusively from top management and the board of directors will not give you the breadth and depth of information that you need, nor will it create ownership among varying stakeholders. It is best to put together a core group of people that represents a cross-section of the organization to work through the strategic planning steps. An ideal planning group has 20 or fewer individuals, but that does not mean that you cannot reach out to other groups and individuals to get their perspectives. Ultimately, you want and need a vision for your organization that bubbles up, not one that is top-down. When done well, strategic planning can have many benefits for your organization. It can create focus and direction for the future, provide goals and objectives that can be evaluated and measured, build teams, give individuals and leadership a sense of control, assist in prioritizing activities, and create scenarios where you can be proactive instead of reactive. In order to achieve these benefits, you must be conscious of the time, resources, and buy-in that are needed to successfully create and implement a strategic plan. Your organization’s future is depending on it. The impact Millennials are having on organizations is being felt around the world and in all industries. The values they place on many aspects of their work and organizational culture differ from other generational groups causing forward-looking organizations to adapt and change. Millennials’ workplace values are similar to those that many nonprofit organizations’ volunteers bring to their work, including a strong alignment with and belief in the organization’s mission and a desire to use their skills in a way that they see as having the greatest impact. 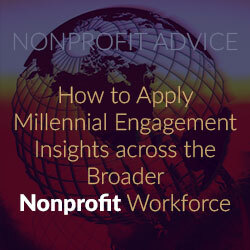 In this article we will explore the traits of these two groups and how nonprofits can apply the lessons learned from millennials’ impact on the workplace to their volunteer force. In a recent leadership meeting at my company, Sapient, we were discussing changes to our performance appraisal system. Having grown over the years into a company of over 13,000 people globally, our workforce today is over 70% millennials. Sapient’s forward-looking People Success group (which is similar but not the same as traditional human resources departments) spent time researching and understanding how this group prefers to be mentored and grown and how that is different to what we had done in the past. Based on these findings, we are changing and adapting our entire performance appraisal model to better serve not just millennials but all of our people. The findings revealed that millennials desire a more personalized approach to career management and growth that is based on their goals and interest areas. As a result, our new model features a more personal, less rigidly-structured program focused on an individual’s development rather than the hard measures and forced rankings that dominate so many traditional performance appraisal systems. While countless studies have focused on how corporations and nonprofits can engage the millennial generation, what many nonprofits have not yet realized is these same principles can be used to engage their wider volunteer force. In fact, volunteers share many of the same values and drivers with millennials: they desire personalization, transparency, authenticity, a sense of ownership and accountability and face-to-face interaction with those setting organizational goals. By recognizing the similar motivators between these two groups, nonprofits can draw important lessons from available millennial research to better engage and support their volunteer workforce. A recent study of over 9,000 high school and college students as well as young professionals entitled The Emerging Workforce: Generational Trends (National Society of High School Scholars, 2013) reveals a variety of career-related preferences and attitudes regarding work atmosphere, job-specific opportunities, salary and perks and the employer perception and image. One of the more interesting findings was the degree to which fairness plays in the minds of millennials as related to employers. Survey respondents ranked “treats employees fairly” as far and away the most important factor in the “perception and image” category. Though not employees, volunteers, like millennials, want to be treated fairly by the organizations to which they’re giving their time. Volunteers may become less effective if a nonprofit is so focused on its outward mission that it overlooks the importance of enabling its volunteers to meet that mission in the first place. For example, volunteers motivated by an organization’s particular cause may find themselves assigned tasks seemingly unrelated to it. This might include doing data entry or other administrative work rather than actually serving the homeless or ministering to sick children. And sometimes organizations rely over and over again on the same trusted set of volunteers – to the point of overburdening them. It’s important for nonprofit leaders to keep this fairness mandate in mind when planning how best to deploy their volunteer talent. Dedication to authenticity is a contributing factor to the establishment of an overriding culture of fairness, so consider building authenticity checks into your normal business processes. Make sure you’re doing what you say you’re doing and holding firm to the commitments and promises reflected in your mission, by including formal checkpoints at your board meetings, in fundraising and strategy sessions and through formal and informal engagement surveys with your volunteers. Your decisions should be made with donor and volunteer perceptions in mind and always in line with the kind of organization you aspire to be. A ground-breaking study of millennials’ attitudes toward work conducted by the University of Southern California and the London Business School in concert with PwC found that despite being comfortable with an array of technologies, “When it comes to communication about their career plans and progress, 96% of millennials want to talk face-to-face, just as 95% of their non-millennial counterparts do” (PwC, 2013). While this finding may be counterintuitive to our perception that millennials prefer screen time to face time, it makes sense at the basic level of human behavior. Not only do personal connections provide the meaningful relationships we crave, but in the workplace, they also serve as a sort of implicit or even explicit accountability check. We all perform better when we have accountability partners to help us along our journey: think Alcoholics Anonymous, whose much-celebrated sponsor model promotes both regular, meaningful personal engagement and accountability. One of the major issues nonprofits face is new volunteers’ perceived disconnect between how they want to contribute and what the organization actually needs them to do. The key to synching volunteer goals with organizational needs is the same two-way dialog employers must have with millennials: establishing a meaningful, ongoing conversation helps build relationships and connections, which in turn fosters a sense of engagement and accountability among the volunteer force. While most volunteers connect on some level with a nonprofit’s general mission, if they also feel a personal dedication to the organization itself, their potential impact increases exponentially. The challenge for nonprofit leaders is establishing the processes and structure that ensure this dialog happens in a genuine and consistent way, so make it a top priority for your organization. Consider pairing experienced volunteers with new ones. They can serve as ambassadors for the organization’s culture and facilitate a connection and dialog between new volunteers and the larger organization. The volunteer spirit is inspiring and defining and at the core of the nonprofit sector. Volunteers make the nonprofit world go round, and in many cases, these organizations couldn’t exist without them. The lessons we learn from corporate workplace studies can and must be applied by nonprofits, which can leverage the information to help improve the volunteer experience – empowering volunteers to reach their full potential and helping to take your organization to the next level. Bingo! Nonprofit and public sector leaders are constantly advised to apply “business best practices” to all aspects of their organizations. But what does this really mean? It’s well-meaning advice usually given by someone with a wealth of business experience – but little nonprofit experience. 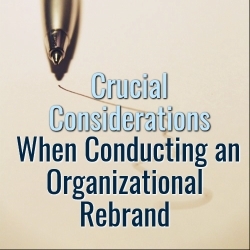 And while there certainly is some value in established best business practices, those that are vaguely applied or applied without proper context rarely provide nonprofits the substance to translate action into desired outcomes. Businesses have been obsessed with metrics for decades, espousing the mantra “You get what you measure.” While it’s true that if you measure something people will focus on it and work hard to improve that measure, there’s a huge missing piece here. 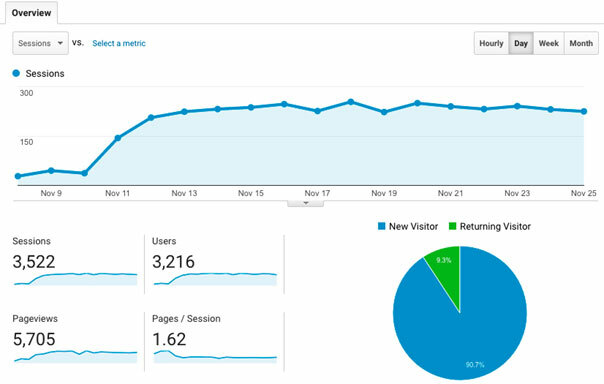 What should an organization measure in the first place and how many metrics are sufficient? These nuanced considerations often leave leaders with just as many questions as they started with. The concept of learning from other organizations is not a new one – from benchmarking to the ethnographic research of management practices, and even plain old first-hand observation of what works and what doesn’t. Over time, these techniques have produced commonly-held business best practices applied to a wide range of organizations and situations, but in many cases without any foundation in the problem they originally were designed to solve. In the worst cases, these once-grounded best practices devolve into management clichés. 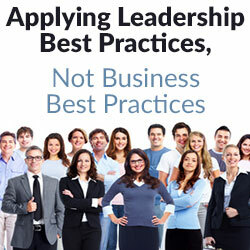 Instead of focusing on business best practices, nonprofits should focus on proven leadership best practices. The following vignettes highlight basic tenets of leadership, which may be more flexible and, therefore, broadly-applied than situation-specific business practices. Instead, these practices are responsive to the unique demands of an organization whose mission isn’t generating shareholder value. In January 1962 in Houston, President John F. Kennedy gave his “moon speech,” a poetic, soaring call to the nation, proclaiming, “We choose to go to the moon in this decade and do the other things, not because they are easy, but because they are hard….”He went on to detail the investments being made, the efforts it would take to get there, and by 1969, Apollo 11, its astronauts – the American people – had landed. The best leaders are those able to establish a compelling vision, build an actionable plan for realizing that mission, and then tirelessly communicate both. Too often people confuse charisma and passion with vision and miss the true power a coherent vision delivers. Vision statements don’t have to live up to the language of a JFK speech or even be focus-grouped to death, but they do have to be inspirational. But an inspirational vision in itself isn’t enough. The less-lofty but just-as-critical next step is creating and implementing an actionable plan: hard work, the fruits of which may not be realized for years. Leaders must keep their organizations focused on their vision and the progress they are making toward achieving it. This requires intense and constant communication, accomplished not in the State of the Union but transparently and in real-time every day. There’s a great scene in the 1982 Academy Award-winning movie Gandhi in which Gandhi and his followers are about to be trampled by charging soldiers on horseback. One of Gandhi’s friends instructs everyone to lie down. What’s clear in the scene is that Gandhi knows nothing about horses’ behavior and must decide whether or not to follow one of his leaders, with little time to consider the alternatives. If he defies him he faces a possible massacre. Gandhi chooses to follow, and in this moment we see him grow as a leader. Potential leaders are buried everywhere in a nonprofit’s organization: on the board, among the staff, in the donor community, and within the volunteer network. With so many sources of potential leaders, a nonprofit executive has to develop a trusted relationship with people who he or she may work with only intermittently. There’s the chance of entrusting someone who doesn’t really know anything about horses, so to speak. To avoid this, many executives instead end up trying to keep control over everything. While this may work for a small department or organization in the short-term, it inevitably leads to burn-out while limiting the potential of the organization and those working in it. Fortunately, most leaders are not faced with Ghandi’s life-or-death predicament. The challenge, though, is in identifying leaders in the absence of crisis and instead staying attuned to those capable of leading in ways both big and small – especially in areas where your own skills and knowledge are lacking. Finally, one of the hardest things all leaders must do is say “no.” Ideas, initiatives, meetings – even the most worthy of those can be distractions. But saying no to something often triggers the fear of missing out: on good candidates, good ideas, good advice. That’s when a good leader channels both JFK and Ghandi, relying on the established vision to guide the way, the action plan to filter the “could” from the “should,” and the organization’s other leaders to help make it all happen. Instead of relying on a la carte business-oriented practices that may or may not address your challenges, nonprofits can apply the universal leadership lessons discussed above to their distinct issues – and perhaps find that leadership best practices are what make business best practices in the first place. If you are passionate about a cause, and are looking to do good in your community, starting a nonprofit may have crossed your mind. Many of the articles you read online make you feel good, but don’t give you actionable steps on HOW to actually set up your nonprofit. Properly organizing and attaining a 501c3 tax exemption is critical to starting your successful nonprofit. Getting set up correctly from the outset will take some investment of time and finances, but provides the foundation for reaping huge rewards. 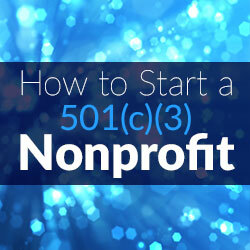 This article will outline the necessary steps to start a 501c3 nonprofit. Keep in mind that depending on the state and your organization, your specific requirements will vary. Step 1: Plan, Plan, Plan! Before you get started, do some market research about your cause or idea to identify the needs of the community. If an existing organization already serves your cause, you may want to join forces instead of creating a new organization. Once you’ve identified the area in which your nonprofit will fill an unmet need in the community, consider enlisting professional assistance to getting started. Service providers, consultants, lawyers, and accountants are all possible people to turn for help. A specialized, experienced professional can help you both in the planning phase and in becoming 501c3 tax exempt. An important early step is writing your mission statement. 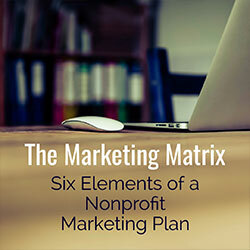 Your mission statement should briefly and clearly describe the purpose of your nonprofit. This statement will be important for your government applications, your solicitations for funding, and more. Take your time with this step! Next up is your business plan, which outlines where will you operate, who will benefit from your programs, how you will generate revenue, etc. Equally importantly, you will want to identify your initial board of directors. Each state has requirements on board member qualification and the IRS will review your board as well. Those individuals should have certain qualifications, and will be able to contribute suggestions, startup funds, and connections that will help your nonprofit grow. 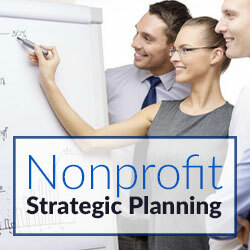 Forming a nonprofit corporation is the foundation for your success. With carefully crafted Articles of Incorporation, you will be able to open a bank account and apply for 501c3 exemption. Forming a nonprofit corporation, a legal entity, also limits the personal liability of the officers and directors. Incorporation consists of a few parts: appointing a registered agent, identifying the incorporators (the individuals executing the Articles of Incorporation), and preparing the Articles of Incorporation with the 501c3 provisions required by the IRS. Articles of Incorporation are filed with the Corporations Division of your state’s Department of State. The cost to incorporate varies by state, but typically is under $100. Incorporation takes anywhere from a few days to a month or more for the state to approve the Articles of Incorporation. Pay attention to any additional requirements your state has, including initial reports to the Department of State and publishing notice of incorporation in the newspaper. Missing one of these filings can cause your nonprofit to lose its corporate good standing before you even start! For your state’s requirements, you can use this National Startup Guide as a reference. Generally, your 501c3 exemption is retroactive to the date of incorporation, as long as you file within 27 months, and the IRS approves your application. As you’ll quickly discover, setting up a nonprofit is a lot of paperwork. 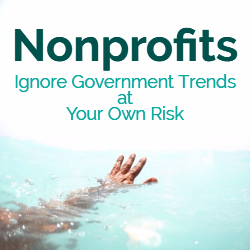 Start compiling important government documents in a nonprofit records book. Keeping electronic copies is often helpful as well! Once you have incorporated, it’s time to establish your organizational records, including bylaws and a conflict of interest policy. The bylaws are your nonprofit’s constitution. They enumerate officer and director positions, term limits, membership, among many other items. A conflict of interest policy is designed to protect the nonprofit’s interest when it considers entering into a transaction that would benefit an officer or a director individually. The IRS requires that you create and annually certify this document. Both the bylaws and conflict of interest policy will be submitted to the IRS, so you may recruit outside help to ensure these documents meet state and IRS requirements. You will ratify these bylaws and conflict of interest policy, select a bank in which to open an account, and approve additional resolutions at the organizational meeting of the Board of Directors. Most states require the board to meet at a minimum annually, though for practical purposes, you may meet much more frequently. The keys are to give advance notice of scheduled meetings, and to keep minutes each time you meet. Your meeting minutes will go in your nonprofit records book. It is a misconception that you only need a Federal Employer Identification Number (FEIN or EIN) if your nonprofit will have employees. All new businesses and nonprofits apply for a FEIN from the IRS. This allows the organization to transact business under this ID instead of the Social Security Number of an officer or a director. If one of the officers or directors has a Social Security Number, you can obtain a FEIN online in just a few minutes. If not, you would have to fax Form SS-4 to the IRS. They typically return a FEIN in under a week. Either way, there is no fee to obtain a FEIN. Practically every bank will need your FEIN in order to open an account. Most banks also will probably ask for recorded (approved by the state) Articles of Incorporation, a copy of your signed bylaws, and personal identification from the officers and directors. Depending on the bank or credit union your board selects, you may be asked to produce additional documentation. It’s best to call ahead and ask before showing up unprepared. Once you open a bank account, you have a place to deposit your hard-earned funds! Once you have Articles of Incorporation, bylaws, a conflict of interest policy, and a FEIN, it’s time to start working on your application for federal tax exemption. The IRS estimates you will spend over 100 hours in researching your requirements, preparing the form, and assembling the application packet. This is the most time-consuming and difficult step, so hiring a knowledgeable specialist to prepare the application correctly and answer your questions is well worth the up-front cost. Filing for 501c3 tax exemption usually requires submitting IRS Form 1023. The form asks for all the details about your organization: contact information, officers and director biographies, mission statement, a narrative of activities, and financial information. Additionally, the form has a number of questions to which a wrong answer will lead to a delay, rejection, or additional questions from the IRS. 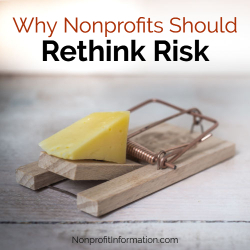 The key is to submit a complete, clear application to the IRS, as you are essentially presenting your case why your nonprofit should be tax exempt. The application fee is $400 for organizations who project under $10,000 in revenue, and $850 for organizations whose projections are higher than $10,000. Currently, the IRS takes about 3-6 months to review Form 1023 applications. If the IRS requests more information because your application is incorrect or incomplete, that processing time will only increase. In July 2014, the IRS released Form 1023-EZ, which is a streamlined version of the original Form 1023 application. The purpose is twofold: to reduce the IRS’s backlog of thousands of applications, and to make becoming 501c3 tax exempt easier for smaller organizations. In comparison to its big brother, Form 1023-EZ is only a few pages long, and can be filed online. The IRS returns a determination letter (which is the document indicating your organization is tax exempt), in under a month, sometimes as little as two weeks. However, only certain nonprofits are eligible. If your organization projects under $50,000 in revenue, and owns less than $250,000 in assets, you may be eligible. Churches, schools, foundations, and international organizations are generally not eligible. Review Form 1023-EZ’s instructions for a full list of requirements. It’s important to get this step right the first time. Rejections become part of your nonprofit’s permanent IRS record. If a contributor reviews your application among many others, a rejection is an easy reason to choose another nonprofit over yours. If the IRS reviews and approves your application, you will receive a determination letter in the mail. This document indicates that your nonprofit is exempt from federal income tax. The letter also stipulates your effective date of exemption, meaning the date from which contributions are tax-deductible. Step 6: The World is Your Oyster…Almost! Congratulations on becoming a 501c3 nonprofit! This exempt status allows you to start fundraising, and to gain access to certain benefits, such as reduced postage rates, conferred only on nonprofits. You are not done, however, as your state might have additional registration requirements. For example, in many states, your nonprofit has to apply for state income or sales tax exemption. Depending on the work your organization does, you might have state or local licenses and permits to obtain. Lastly, and most importantly, is your state charitable solicitation license. The subject of nationwide fundraising registration is a complex one, and for this article, we will only mention some key points. This is an additional registration that takes place after you become a 501c3 with your state’s charitable solicitation authority, typically the Attorney General. About forty states have a registration requirement, and in most states, you are required to register before you solicit funds. The purpose is to protect the state’s citizens from unregulated or illegitimate charities. Additionally, your donors can and will search the state’s database of charities before they give. Registration is done initially and renewed annually in most states. The fee your organization pays depends on your state and revenue. For more information on nationwide charitable solicitation fees and registration requirements, click here. Becoming a 501c3 nonprofit is extremely rewarding, as it allows you to bring about change in your community. By following the proper course, and seeking the proper guidance, you will be tax exempt, and be able to fulfill your nonprofit’s true purpose.